Chicago has one of the most democratic food cultures in the world. Food critics may marvel at the inventiveness of our high-end restaurants, and rightly so-- but there's great food to be had at every price point, reflecting every immigrant culture from Afghan to Yunnan, in neighborhoods all over the city and suburbs. 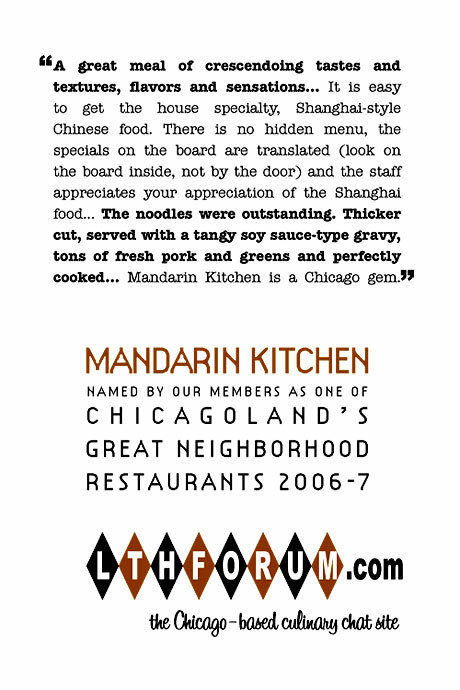 The LTHForum Great Neighborhood Restaurant awards reflect this democratic spirit by offering non-professionals-- the food-obsessed members of LTHForum.com, the Chicago-based culinary chat site-- the chance to nominate the places that mean something special to them. High or low end doesn't matter; what matters is that a restaurant stands out among others of its type, and that it contributes in its own way to Chicago's colorful, vibrant, sometimes even surreal mix of cultures. Once nominated, restaurants are then ratified by the moderators of LTHForum, based on the degree of discussion and community-wide enthusiasm evidenced on the site. In this round, 23 restaurants were chosen, from a hot new spot making authentic Neapolitan pizzas on the north side, to an obscure Chinese hole-in-the-wall serving up handmade noodles from a strip mall in suburban Westmont. The largest group of honorees this time is Latino restaurants, reflecting the tremendous diversity and authenticity of Chicago's Mexican, Cuban and Puerto Rican restaurant scenes. The seven Latino restaurants chosen take in everything from a fancy Pilsen bakery reflecting the influence of European pastry traditions on Mexico, to tiny taquerias making spicy, greasy and deliciously authentic chalupas, enchiladas potosino and chilaquiles. Click on a restaurant’s name below to see its certificate and nominating thread. Burt's Place-- A pizza master who started several of the area's best-known spots now holds court and serves great deep-dish in this homey little spot hidden on a side street in Morton Grove. Calumet Fisheries-- One of the last shrimp huts of its kind, serving up addictive smoked and fried shrimp and fish in the shadow of the Skyway and the steel mills. Priscilla's Ultimate Soul Food Buffet-- Fried chicken and other stick-to-your-rib soul food classics served up cafeteria style on Roosevelt Road in Hillside. Scooter's-- Nothing says summer in Roscoe Village like the seasonal opening of this happy stand serving up creamy custard in the tradition of legendary spots like Kopp's in Milwaukee or Ted Drewes in St. Louis. Volo-- Wine bar and restaurant serving up innovative small plates to families and trendies in Roscoe Village. Hopleaf-- Andersonville fixture packing them in for a Belgian-focused beer list and hearty European bar food like mussels and frites. Katy's Dumpling House-- Despite the name, handmade noodles are the real star attraction at this tiny spot in a remarkably diverse ethnic strip mall in Westmont. Mandarin Kitchen-- And despite their name (carried over from a previous owner), this underappreciated Chinatown spot mainly serves up fresh, authentic Shanghainese food. La Unica-- Make your way through this Rogers Park grocery and you'll find a lunch counter in back where Cuban-Americans of all ages enjoy authentic cafe de cubano, Cuban sandwiches and more. Shan-- Edgewater quickie-mart unexpectedly serves up hot, fresh and delicious Indo-Pakistani food along with the Marlboros and Lotto tickets. Spacca Napoli-- Owner Jonathan Goldsmith studied pizza-making in Italy and imported a massive wood-burning oven (and a pizza chef) to make the best and most authentic Neapolitan-style pizzas Chicago has ever seen. Hai Woon Dae-- Authentic-feeling, popular Korean BBQ spot where you can sit at a table or on mats to grill your own meat over charcoal. San Soo Gap San-- Almost-24-hour Korean barbecue spot has stern owners who probably don't quite know what to make of the late-night hipsters scarfing down delicious Korean grilled meats and soups. Bombon Bakery-- Chicago's best Mexican bakery (and maybe best bakery period), this highlight of any visit to Pilsen is owned by a couple who trained under Rick Bayless and in Europe. La Casa de Samuel-- Sitdown Little Village Mexican restaurant (with a mariachi feel) offering fine handmade tortillas and some unusual specialties like venison. Fonda del Mar-- Upscale but reasonably priced Logan Square Mexican restaurant stressing high quality seafood dishes. Nuevo Leon-- Simple, delicious norteño Mexican food at a family-friendly, consistently popular Pilsen institution. Taqueria Puebla-- Soccer-themed Humboldt Park stand specializing in freshly-made cemitas-- Mexican sandwiches with a smoky blast of chipotle heat. Salam-- Unassuming spot on the Albany Park middle-eastern strip offers some of the best falafel, kefta kebab and shawerma in town. Sticky Rice-- Chicago's first Thai restaurant devoted to Northern (Isaan) Thai cooking offers a wide range of pungent dishes (only a few of which involve bugs). A delightful and eclectic selection once again. Special thanks to those who put extra effort into the GNR program, Ramon, Flip, nr706, MikeG, and all the LTHForum members who post, nominate and discuss these and so many more places.